I have been heads down hammering away at my Christmas shopping for the past two weeks. I told myself it would all be done by December 4th, so naturally here we are on December 14th and I am not yet finished. But I intend to complete the Purchasing Phase of my shopping this weekend so I can then move on to the Disappointment Phase. Like last year, when my daughter asked Santa for a princess castle. Just a castle! So of course Santa researched the options for days and got her a lovely wooden castle with matching dolls. She played with it once. ONCE. I think we can all agree that alone was worth the investment. I’m also trying to keep up with holiday festivities. We tried to see Santa last weekend but the wait was two hours. Wha?! I do not have the patience for that action. Apparently the neighbor kid Skype’d with Santa. Initially I thought it sounded stale and dumb, but now I think her parents might be brilliant. We are not wedded to many holiday traditions, but I’ll admit we have an Elf on the Shelf. Please don’t stone me. I didn’t realize what I was signing up for when I bought it two years ago. I do not have the memory or commitment to be a successful Elf parent, as evidenced by the fact that our Elf didn’t arrive until December 10th, and I think I gave her a concussion this morning when I threw her across the room in a last minute attempt to move her before my daughter turned the corner. “Look Mom, she’s sleeping!” Yes, dear. She is. We also have an advent calendar. The other day we noticed my daughter has already opened nearly every candy cane in it. How odd! Then when she thought no one was watching, we saw her lick her fingers, wipe them on several candy canes, and stick her fingers back in her mouth to savor the sticky goodness. Ahh kids. Nothing is sacred when sugar is involved. Other than that it’s just the usual miscellaneous December activities – toy drive, food drive, stocking drive, school fundraiser, preschool fundraiser, preschool party, Girl Scouts, two kindergarten field trips. WHY DOES IT ALL HAVE TO HAPPEN THIS MONTH? Can’t we space this stuff out throughout the other 11 months? But I do love watching my kids experience the holidays. The other day my husband was explaining to my daughter that different people have different traditions. “What’s a tradition?” she asked. My husband doesn’t shave his eyebrows and we have no idea where it came from, but I liked it so much we might need to start doing it every year. It would make our holiday cards way more interesting. This entry was posted in Uncategorized and tagged holidays, Parenthood by BananaWheels. Bookmark the permalink. 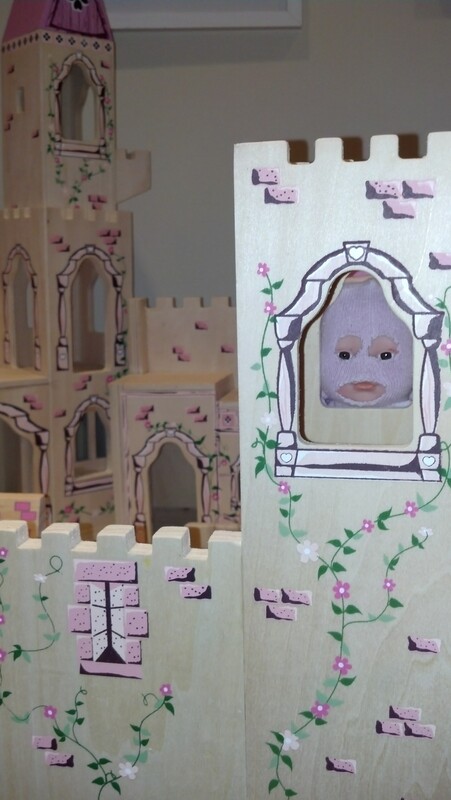 Without a doubt, the castle was worth every penny for Creepy Baby’s sake. I am not crying that we missed the Elf on the Shelf craze, although I fear Santa may call in the authorities when he finds out what you’ve done to yours. WAIT, HE SEES EVERYTHING! You’re screwed.